1BR/1BA DELUXE- + 60' VIKING YACHT! Sleeps 4 with pull out sofa bed. Limited Kitchen. Come feel the wonders and relax in this smaller more personable resort, where the service is impeccable and friendly! 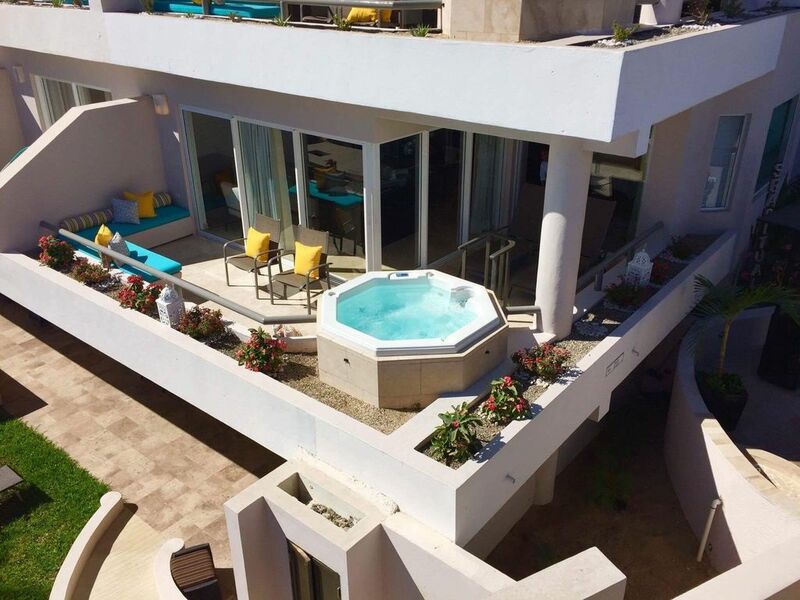 The One Bedroom Deluxe boasts a beautiful view of the Sea of Cortez! The Condo has a sofa bed and sleeps four adults comfortably. Relax and enjoy the music on the very cozy sofa beds w/umbrella on the beach where you just have to wave for any beverage or tasty treat you desire. Or relax at one of the three pools available on the resort. Go up top to the Baja Brew House for your choice of many locally brewed beers and a great pizza! Choices of other size/types of accommodations are possible, and can be requested. Call to get details on the FABULOUS new VIKING FISHING OR EXCUSION BOATS available! We can give you all the details of how YOU can charter one of these GORGEOUS vessels for the day! My Husband and I reside in Slidell, LA, 25 miles outside of New Orleans! We love coming to Cabo San Lucas for the beauty of the area, relaxation, and the fun, friendly staff of our resort! Cabo Villas Beach Resort has always been the most accommodating resort, with a feeling of being with family! Many of the Service Members have been there for years, and we enjoy seeing them each year we return. Cabo Villas is feverishly working to update and adding more condos, retails, restaurants and fabulous pools and cabana areas! I can't wait to get down there again to see what's new! A smaller resort to me make the stay more enjoyable. We can request or see our favorite staff member who knows just what we want when we want it. Everyone on the resort grounds are like family to us after all the years of vacationing there. In some of the larger units. In some of the larger units. But they do have linen service at a very reasonable rate. Unit may or may not have one, but the maid service will accommodate and clean. No pantry items or food is provided. But there is a mini market on the premises, as well as a Walmart close by for shopping and stocking! There is a dining area, with comfortable accommodations. In each of the living room and bedroom. We can reserve one of two 60' Viking boats for your pleasure for a nominal fee. Not far from the resort. There are three total. One is adults only. There are many areas to go and things to do. You just have to ask! This property is located right on Medano Beach at Lands End. A short walk to the fabulous Marina, where there are restaurants, shops and casino activity.